One of the many things I really like about the banking system in Estonia is how well integrated it is with various other online systems. In particular, I really like how, if I’m booking flights on Estonian Air, I can pay directly from my bank account rather than having to use a credit or debit card. At checkout I just select my bank, and get transferred to my normal internet banking system where, once I’ve cleared security, I get a pre-filled form for making a payment to the airline. Then as the transaction can happen in pretty much real-time (Yay for no clearing cycles), the airline can confirm my payment and complete the transaction straight-away. Estonian life is full of little things like this that just Make Sense. In the UK there would be a million reasons given why you could never do something like this. Here they just make it happen. With all remnants of the winter snows gone, temperatures up 10°, and a few extra hours of daylight. Tallinn is becoming a different city. The tourists are starting to arrive en masse, wheeling their crates of cheap vodka, beer, and cigarettes around their harbour. Yesterday I took advantage of a sunny day to explore the Linnahall. 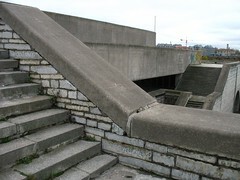 This was built for the 1980 Olympics, and serves as a ‘bridge’ into the city from the harbour. Any of my readers who went to QUB can consider it a cross between a Mayan temple and the David Bates Building. Mostly it’s a huge series of crumbling stone steps on a wide variety of split levels. I’ve wanted to investigate this since I arrived here, but it’s precarious enough to navigate parts of it, and it would be almost impossible in snow. A building like this could never survive in the UK. The safety elf would have it closed down in a heartbeat. Stone steps that have crumbled away into nothingness, with no handrails, and no guard rails to stop you tumbling over the edge are a distinct no-no there. Walking across the top of buildings generall doesn’t seem to be a major tourist pastime in the UK. It doesn’t seem very touristy here either. A few tourists peer quizzically at it from a distance, or take a few photographs, but clambering all over it seems to be reserved for locals – particularly at the sides and back, which are covered in graffiti, and where you have also have to keep a look out for extreme cyclists racing down the slopes at the sort of speed where they’re not going to be able to get out of your way. It’s been a hectic 6 weeks, and I haven’t had a lot to write here, mainly I haven’t actually been in Tallinn much. Two trips to California, and another one back to N. Ireland have fried my brain. I have no idea what month it is, never mind day, or timezone. Grrr. The story of How Easyjet Ripped Me Off needs to be told more widely than just this little distributary. Hopefully the extra googlejuice from my main blog will spread the warning wider afield. I’ve just returned from California for the second time in a month, and my body is getting really rather confused. One thing that should help this time is the extra daylight. We’re fast approaching the cross-over point of 12 hours of daylight, and the extra 5 or 6 minutes a day adds up quickly. On top of that, even though sunrise isn’t officially until about 7am at the moment, it’s getting light quite a bit earlier than that. 5am this morning looked similar to how 9am looked when I arrived in December. I’m operating mostly on US time so I don’t notice sunset quite so much, but there’s a few interesting events on over the next few weeks that might manage to drag me out of my apartment of an evening. Last week I was in California for the second time in a month. This caused a raised eyebrow from the immigration officials, and I also got to join the “special screening” line at security (I think it was a mix of having only hand luggage, and not having any part of my journey involve the country that issued my passport). But the most interesting part was trying to book a hotel in Palo Alto. I was booking at the last minute, so all my first choices had either no, or restricted, availability. I eventually got booked into the Comfort Inn Stanford/Silicon Valley, but it was a painful experience. Their website availability guide didn’t work at all on Firefox on a Mac, so I had to switch to the PC just to check if it was even worth trying to call them. When I did call them (Yay for Skype allowing me to call US Toll-free numbers from abroad), things descended into farce. I don’t think my accent is that strong – at least compared to many people I know – but they just couldn’t understand at all some of the things I was saying. I don’t recall ever having to explain before that ‘eight’ is ‘the number between seven and nine’. I was also pretty sure they got my name wrong (it sounded like they were calling me ‘Tomy’, like the Japanese toy people), but I guessed it was more trouble than it was worth to correct this. They also really couldn’t handle international phone numbers – not only are they too long to enter into their form, but the concept of starting with a plus sign seemed to really confuse them. They eventually gave up on trying to take my address after at least three times around the “Where?” / “Estonia” loop, with a higher degree of incredulity to the question each time.